Halloween is a wonderful, whimsical, and playful holiday that can bring out the kid in all of us. Unfortunately, it can also bring out the sweet tooth in all of us. The act of sharing sweet treats around the end of October is ancient. Nowadays Halloween brings with it more than just a treat or two- it brings a giant pillowcase full of candy, office and school parties with endless delights, and an invitation to indulge in all things seasonal (candy corn flavored Oreos, anyone?). I personally love Halloween and want to celebrate it to the fullest- but how can we do it without busting our belts or giving ourselves a cavity? Don't fret- I've got you covered with some ideas for keeping festive while keeping control of your (and your family's) candy intake. 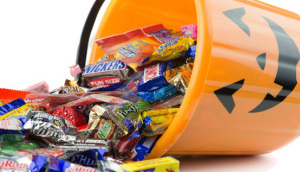 First, check out the non-candy alternatives for trick-or-treaters. Target has some cheap Halloween finds in their bargain bins, including packs of Halloween erasers, spider rings, pencils, mini-playdough tubs, and other spooky treats that aren't candy. I've heard from my friends that kids don't like getting non-candy treats in their goodie bags. I personally think anyone who's too old to appreciate a nice spider ring is too old for trick-or-treating, am I right? Just make sure your treats are festive- avoid the urge to pass out pennies or tooth brushes. If you're into the candy tradition, choose to give out candy you won't be tempted to eat yourself or buy it at the very last minute so you're not haunted by the ghost of your favorite candy sitting in a bowl on your table for a week. Aside from trick-or-treating, there are a hundred ways to celebrate Halloween. Take a stroll through the fall leaves, decorate your house with spooky decorations, carve pumpkins, tell a ghost story or go to a scary movie, take a hayride, visit one of the many haunted houses set up for the season, or find a Halloween craft the whole family can enjoy. On Halloween day, share a healthy, but festive, meal with your family like pumpkin chili or a spooky meatloaf. Keeping your celebration focused on other Halloween traditions, not just trick-or-treating, can take some of the focus off the candy and give you and your family a happy (and healthier) Halloween.